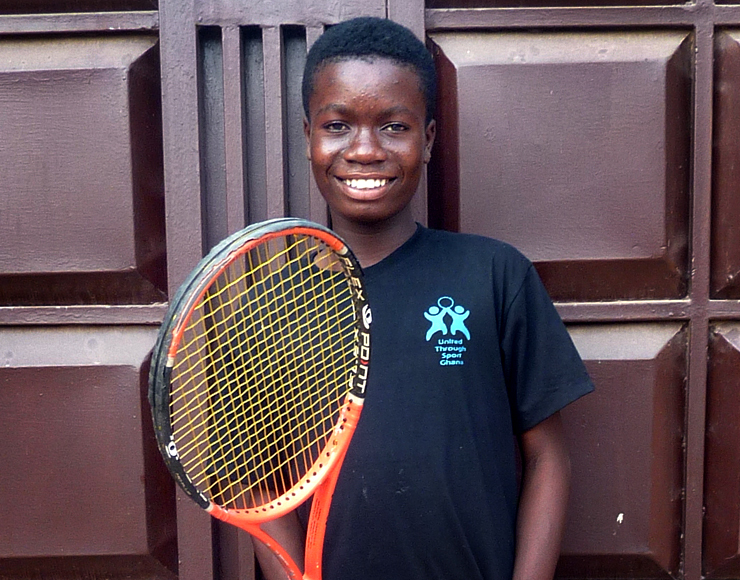 Earlier this month, United Through Sport Ghana’s youngest Tennis player, Reggie Okai was selected to join the Ghana National Tennis Team to travel to Togo for the ITF West And Central Africa Junior Championship Qualifiers. 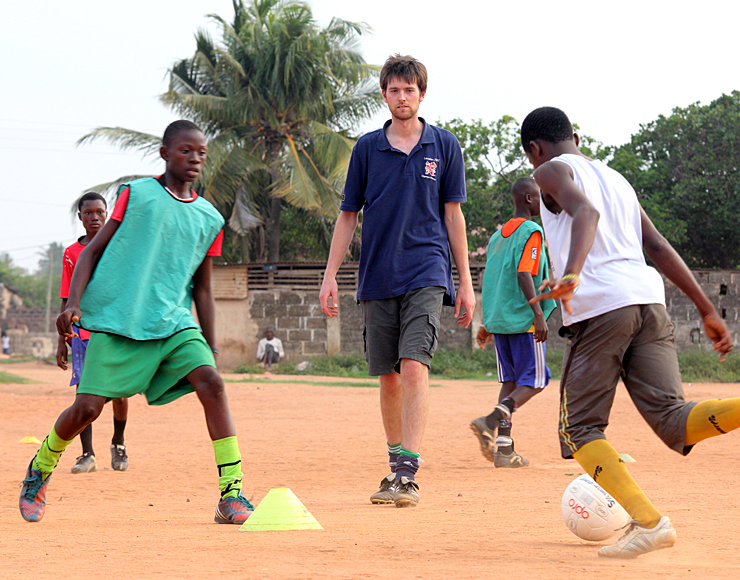 The tournament took place from the 11th to 17th January 2015 in Lome, Togo – Reggie was part of a 10 player team that was called up to the Ghana National Team. 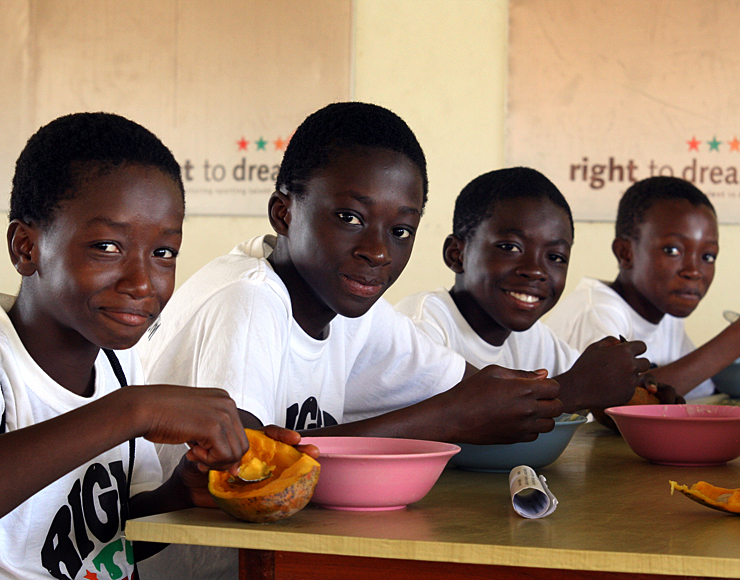 He joined fellow Ghanaian players to compete alongside rival tennis players from across west and central Africa. As a novice to this level of tournament, Reggie didn’t let the sense of occasion phase him. 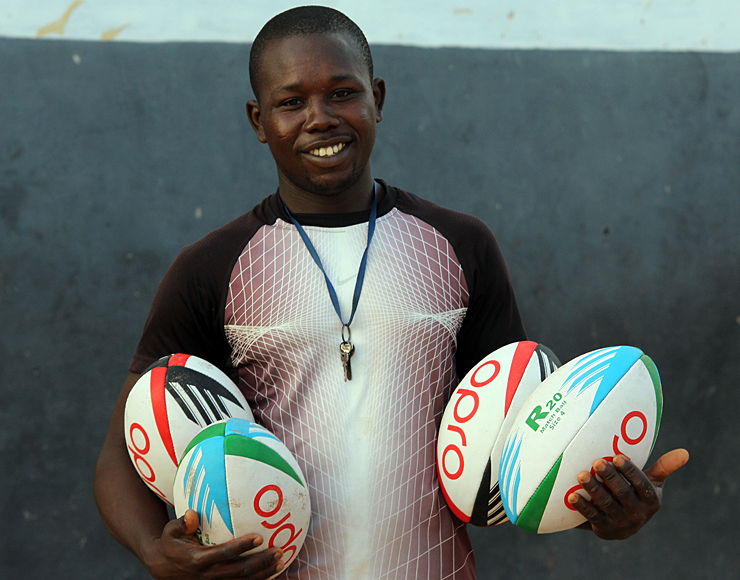 He played some incredible matches, defeating some extremely talented opponents from all over west and central Africa. As the tournament got into full swing, Reggie flew through his rounds and surprised many of his fellow team mates as well as coaching staff. Reggie and the rest of the team all played exceptionally well, most of his colleagues had played in Junior tournaments previously however this was Reggie’s first junior tournament. As the matches began Reggie delivered consistent winning performances in both the singles and doubles tournaments. 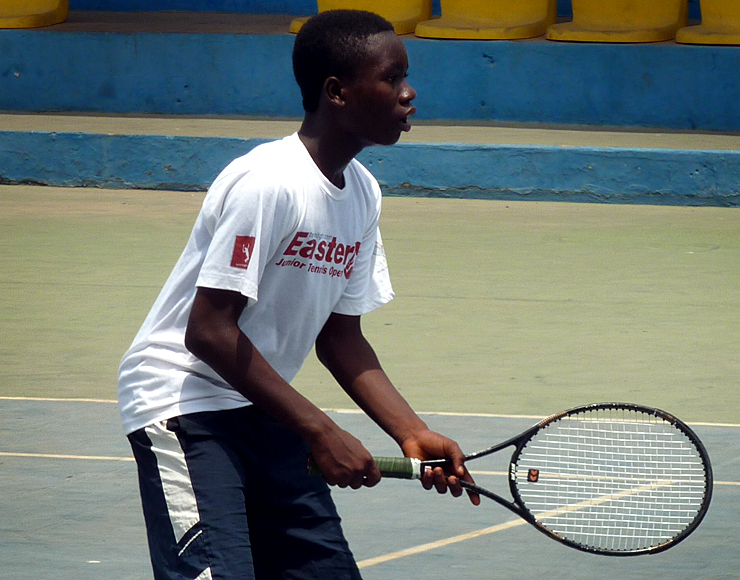 He completed the tournament in fifth place overall which was a fantastic achievement alone but his place in the final standings meant that Reggie was also the only member of Ghana national team to qualify to play in the forthcoming ITF/CAT African Junior Championships which is being held in Tunisia in March 2015. Everyone in Ghana is extremely proud of Reggie and his fantastic achievement, we wish him all the luck in the world in the Junior Championship Tournament and will be supporting him every step of the way. 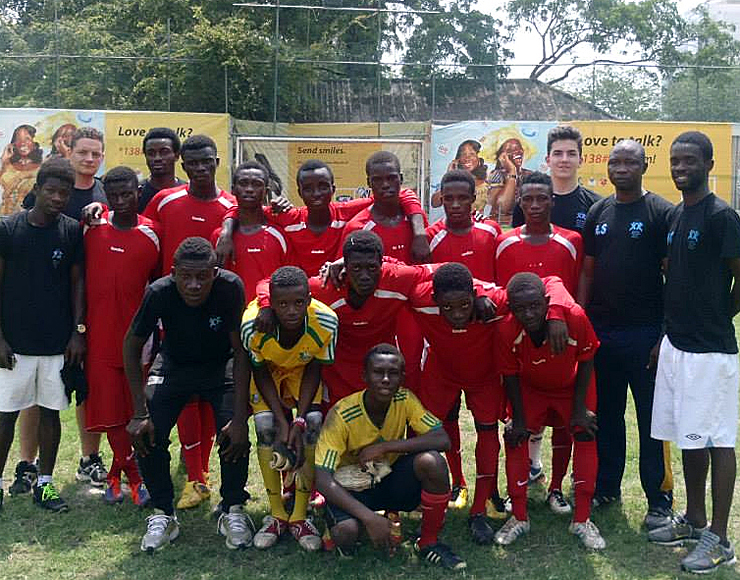 The Ghana Academy boys recently enjoyed a weekend trip to Sogakope in Ghana’s Volta Region to play the West African Football Academy, which up until recently was known as Feyenoord Football Academy – an incredibly good and well known Academy in Ghana. 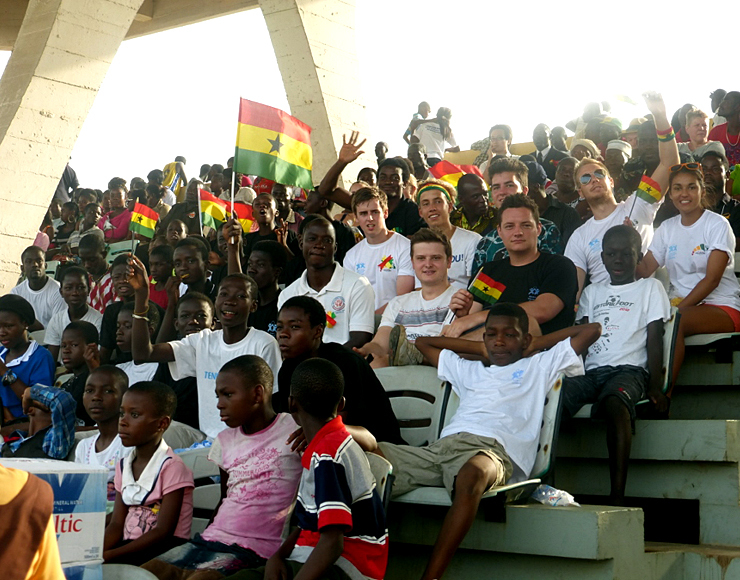 For this meeting our U13 and U17 squad’s represented United Through Sport in Ghana and did incredibly well. The U’13s started brightly with some excellent pressure on the Feyenoord defence. As the game continued, more pressure from striker Wisdom Afrani led to a mistake at the back and he capitalised by rounding the keeper before slotting the ball away for a 1-0 lead. The boys were playing really well and with the pace from Sadiq Bawa threatening down wings led to the second goal, a great run by the winger with a calm finish in the bottom corner! The second half started slowly in the 40 degree heat, a good move from Feyenoord ended in a good finish to half the lead United Through Sport had at half time. A few injuries forced a couple of substitutes which saw some of the younger development squad (U’11/U’12) boys make their first appearances for United Through Sport. With around ten minutes left a fantastic goal was scored by the United Through Sport side clinching a third goal. The ball was won in the centre of the pitch and a great move sweeping out to the right wing and quick low cross was put away by the goal scoring midfielder Charles McCarthy! A great win for the boys against very tough opponents. The U’17s started well holding on to the ball and playing some nice football. Unfortunately their good play didn’t lead to us taking the lead. Feyenoord hit us on the break and a nice finish put them 1-0 up. Not long after the opening goal we equalised with a very powerful finish from Ibrahim Sulley from a tight angle. The second half was a close battle with neither team really taking the initiative, the midfield was being controlled by Joseph Amoah – who recently just returned from a training tour in the UK with St Mirren and Portsmouth – the game was ticking by and unfortunately Feyenoord hit us on the break and scored a second goal, after an initial good save from Amadu Ibrahim. A close game, but in the end we fell just short, despite controlling the game! 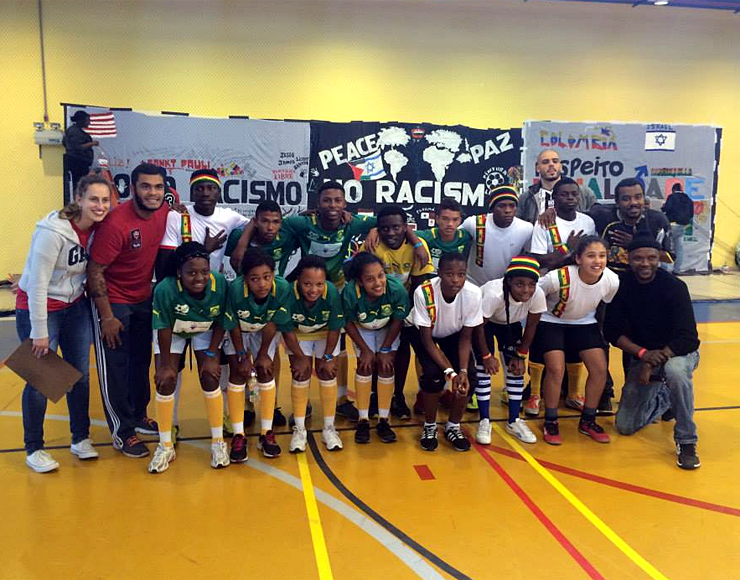 After cruising through the group stages of the Street Football World Cup with three wins, United Through Sport South Africa were given an extremely tough round of 16 clash against Africa Continental Champions Ghana. Going into the clash, Ghana were regarded as one of the favourites to win the tournament, with a much older and stronger group of players and only one female in their line-up. Ghana also boasted two full time professional players in their ranks. So this was always going to be a David V’s Goliath situation. The United Through Sport team fought bravely throughout the game and late in the second half looked like possibly causing an upset after coming back from 4-1 down to make the score 4-3 and give Ghana a tense last few minutes. 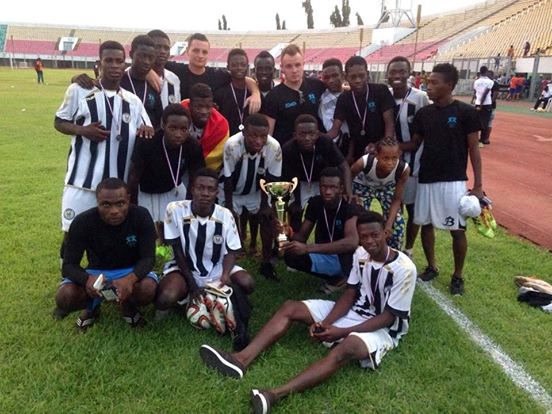 Unfortunately the upset was not to be and the game finished 5-3 in favour of the older more experienced Ghana side. Our South Africa side showed their integrity throughout and came away with maximum value points for fair play, respect and cooperation, with Ghana only picking up one point out of three. We now fall out of the main competition but go into a ‘Fair play’ group to continue to fight for further honours. 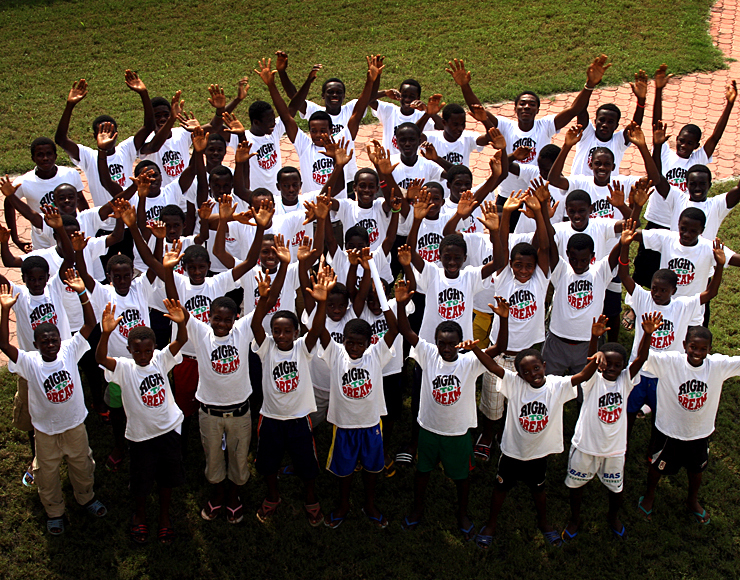 The United Through Sport Ghana Academy football team have come a long way in their short time together. This Saturday they faced their toughtest test to date. 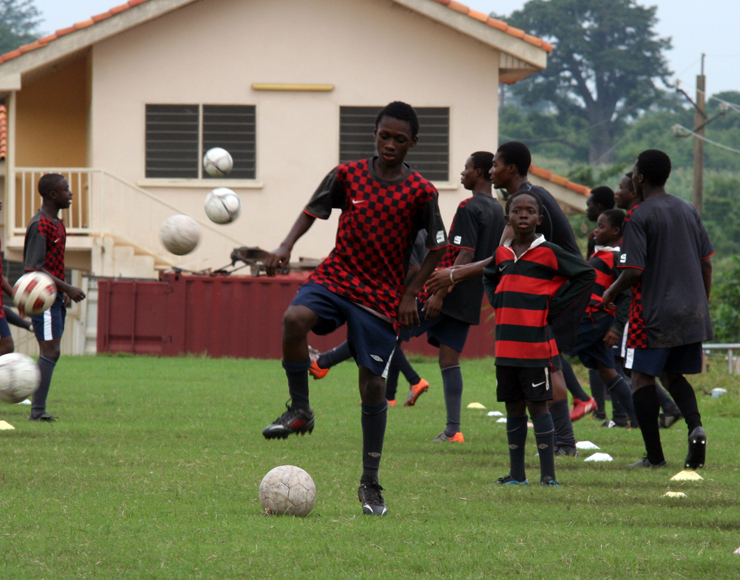 St Thomas Aquinas Senior High School in Central Accra played host to the United Through Sport Ghana Academy versus Right to Dream Academy, considered by many to be the finest Academy of Football in Africa, with both the U17s and U15s matching up against each other. The first game of the day featured the U17 age group. A cagey start from the United Through Sport team saw a few nervous misplaced passes whilst neither team looked too desperate to take risks by committing men forward. 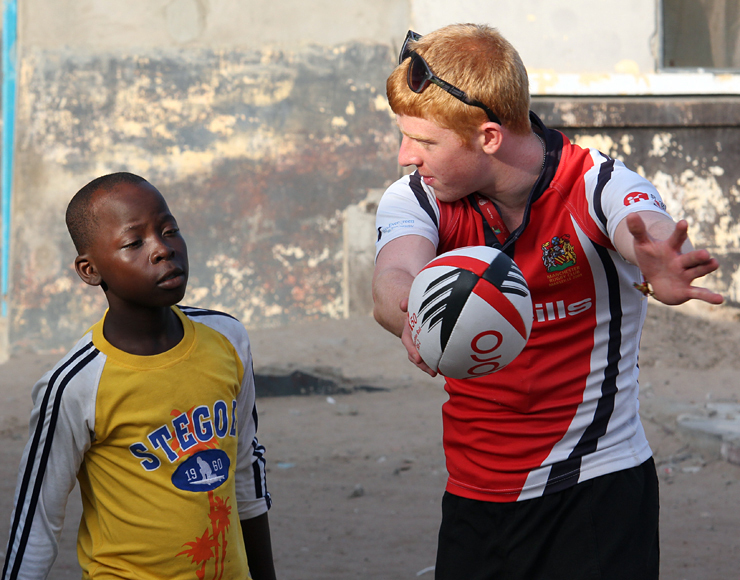 The relentless strong African sun did not slow the pace of the game. Incisive pass and move football down the Right to Dream left flank worked space in the centre only for United Through Sport left back William to make a last gasp saving block to keep the scores level. Most of the action occurred down this side of the pitch, with right back and winger James and Stephen [respectively] combining effectively to test the Right to Dream goalkeeper half an hour into the tight contest. Minutes later United Through Sport full back James Kumah again went on the overlap. After cutting inside onto his left foot his pile-driving effort cannoned off of the bar to the relief of the helpless goalkeeper. The United Through Sport team were growing into the game, their strong midfield double pivot allowed the wingers and forwards to roam and cause problems for the opposition defence. Opportunities were narrowly missed and the game remained goalless. Two Right to Dream midfielders were booked in close succession for cynical fouls that disrupted United Through Sport breaks. 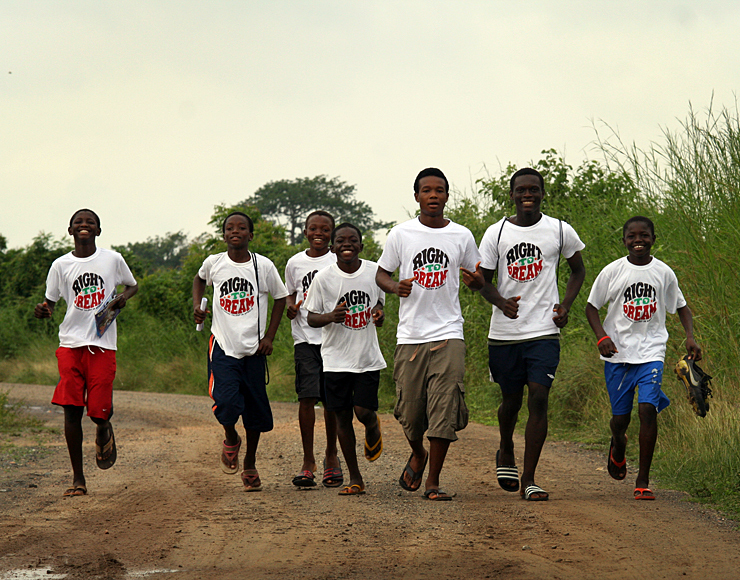 The United Through Sport right was exposed in a move that saw the Right to Dream Academy take the lead. Some slick one touch pass and move football created the space for an inviting cross that was met with a firm half volley from the Right to Dream striker. Somewhat unfairly, the UTS team found themselves behind on the stroke of halftime. This served as a poignant reminder of the quality and ruthlessly that their opponents possessed. 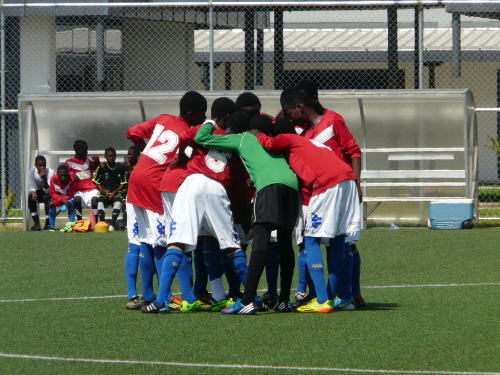 The United Through Sport Academy did not let their heads drop, knowing they had played the majority of the first half in the Right to Dream half and knowing they had more than earned the right to play their esteemed rivals. One half time change and rousing team talk immediately had the desired effect, substitute right winger Ibrahim controlled a fantastic deep cross and drilled a stinging shot across the goal into the bottom corner of the goal to level up the score. The momentum was with the United Through Sport team now. 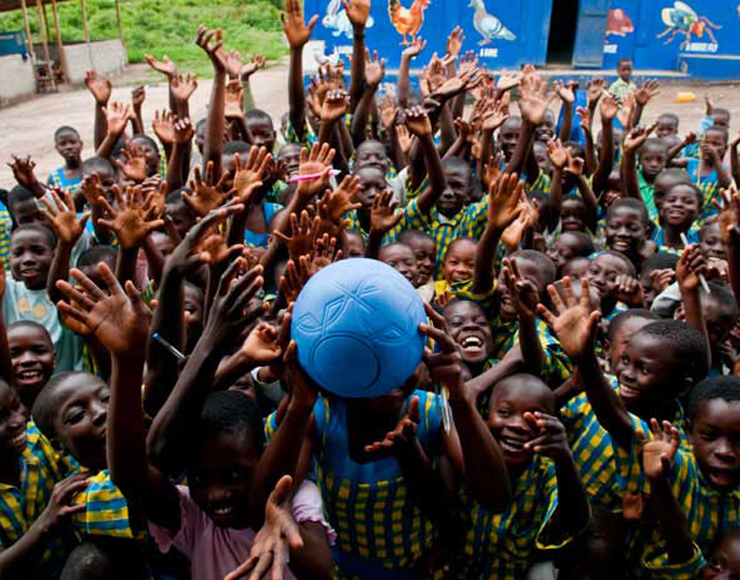 Successive efforts at the Right to Dream goal from free kicks served as further warning that this game was not over. The Right to Dream defence had enjoyed a lot of possession along their backline with only the United Through Sport forwards, Ernest and Shaban, tasked with closing down. Their toil paid dividends when an interception followed by a lightning paced give and go passing move put striker Ernest Gyan one on one with the RtD goalkeeper. His cool finish sent the team, and large spectacting contingent, into raptures. Despite heavy late pressure and an injury to the United Through Sport goalkeeper, the United Through Sport Academy team held on to give them a huge and well deserved, morale boosting victory. The U15 game was also a tense affair. Both teams struggled to carve out any notable chances and both goalkeepers were alert to the long range efforts that each defence restricted each other to. The most notable moment came late in the second half when a well worked move involving winger Richard Owusu and Ibrahim Sulley (appearing in both games) led to a penalty award for United Through Sport. Captain and Man of the Match, Daniel Mensah sent the keeper the wrong way but unfortunately sent his spot kick just wide of the post. Retribution came for the United Through Sport Captain as his excellent reading of the game allowed him to make an excellent goal line clearance and preserve the goalless scoreline, which was how the game finished. The effort of both United Through Sport teams were fantastic on the day and made a big impression on the visiting side and their entourage. Results such as this one serve to remind the players that hard work can lead to attainable success and that nothing is impossible. 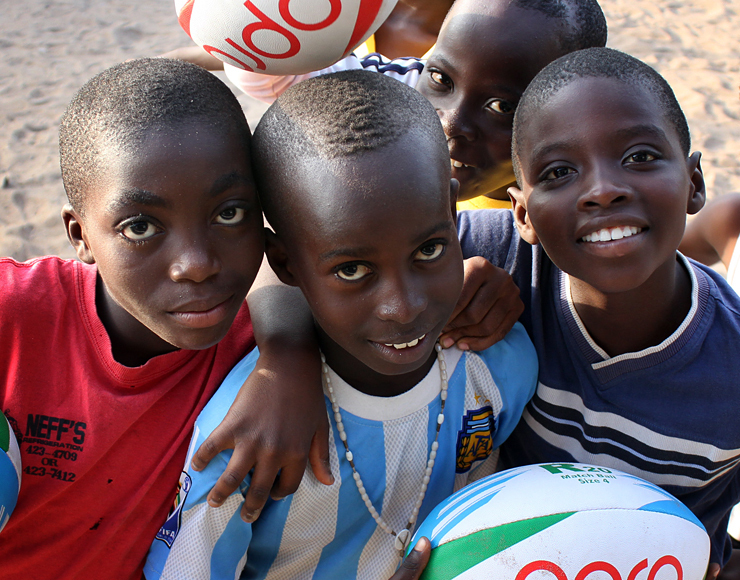 In recent Summer tournaments the Right to Dream youth teams have gained creditable results against such worthy academies as; AC Milan, Boca Juniors and Manchester United. 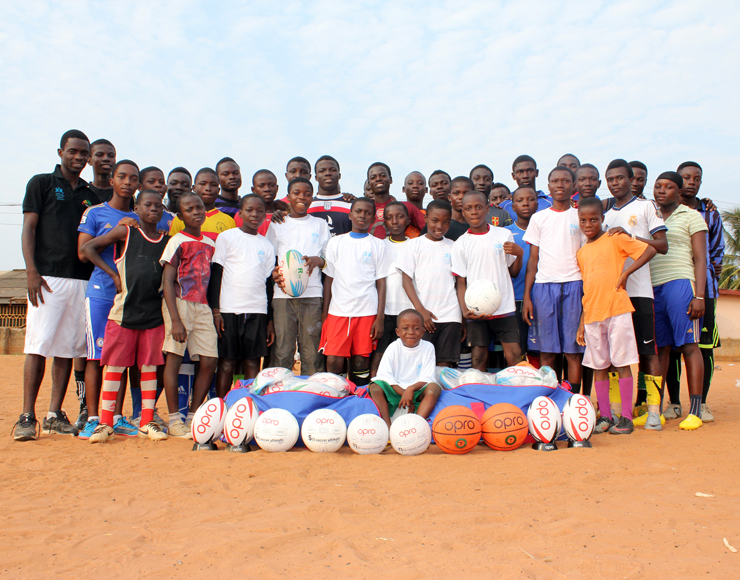 With many of the Right to Dream players expected to one day make the professional grade, these results can inspire our players to continue working hard towards this ultimate goal, shared by all at United Through Sport Ghana.